Sölden in Ötztal – popular summer hiking and mountain biking destination in the summer, one of Austria’s top ski resorts in the winter.Sölden boasts 300 kilometers of signposted hiking trails. Awesome views of mountain lakes and snow-covered peaks are the reward for hiking at high altitudes. Several lifts are open to get you to the top of the mountain. The trails are dotted with 30 hSölden offers a great selection of lodgings, from luxurious hotels to cozy B&Bs and apartments for your hiking or skiing holiday in Tirol.uts and 16 refuges for overnight accommodation. Sölden offers challenging mountain bike trails leading from flower-filled pastures to the eternal glacier ice. Sölden's Ski Area includes two glaciers, Rettenbachferner and Tiefenbachferner, ranking among the Alps’ best-known ski destinations. 150 kilometers of slopes ensure first-class ski holidays for all skill levels. From glacier skiing to Sölden’s famous après-skiing: winter holidays are as diverse as they are marvelous! Sölden is also venue of the FIS Alpine Ski World Cup opening race. The Freizeit Arena offers indoor swimming pools with rock grotto and white water river, tennis courts, bowling and more indoor fun. In lovely Sölden there are some 2000 meters of altitude difference between the base terminal and the top station of Bergbahnen Sölden mountain lifts - giving access to a wonderful freeride and freestyle dorado. Immaculate powder snow slopes offer everything a snowboarder's heart could possibly desire. The huge Sölden ski mountains promise superb off-piste adventures for all preferences and ability levels. Amidst the Giggijoch ski area in Sölden both skiers and off-piste fans will find enough space for unlimited winter sport adventures thanks to wide open ski runs without any moguls – perfect carving terrain! Right below the Hainbachkar and Silberbrünnl chair lifts there is also the action-packed AREA 47 Snowpark Sölden featuring massive kickers, boxes and rails. Expert park rangers take care of the snow park all winter long. Deckchairs promise a really unique snowboard day coupled with relaxing hours in Sölden. Sölden. Hot Spot in the Alps. Sports and activities for all levels and ambitions: hiking, walking, mountain biking (Ötztal Trail), cycling, paragliding, rafting, canyoneering. Professional training camps and made to measure programs for international sports teams and sports pros alike. Hiking Trails & Glacier Marathon ... Sports and activities for all levels and ambitions: hiking, walking, mountain biking (Ötztal Trail), cycling, paragliding, rafting, canyoneering. Professional training camps and made to measure programs for international sports teams and sports pros alike. Sölden. Hot Spot in the Alps. Enjoy first-class skiing and snowboarding on 150 kilometers of impeccable slopes in one of Europe's most famous ski areas. Skiing from 3250 meters above sea level all the way down to the town at 1377 meters. Superb snow conditions until well into spring thanks to the two glaciers (Tiefenbachferner, Rettenbachferner) and state-of-the-art snow making facilities. Sölden's signature mountains, the BIG3, are all accessible via modern gondolas and offer awe-inspiring views. Experience the Power of Opposites ...This is how holidays must be. Float warm thermal pools, let the soothingly warm water caress your body and soul and forget about everyday life for a while. The water at the Aqua Dome in Längenfeld has approx. 34 to 36 degrees. Close your eyes and dream of skiing. 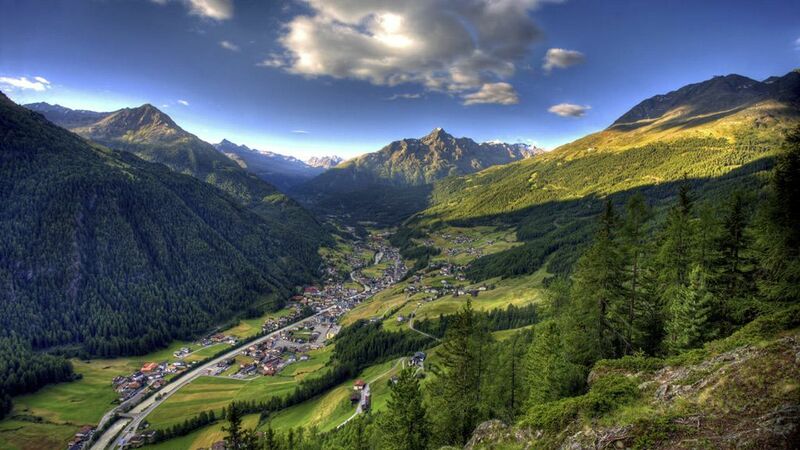 Open your eyes and see the snow-capped peaks of the majestic Oetztal Alps.